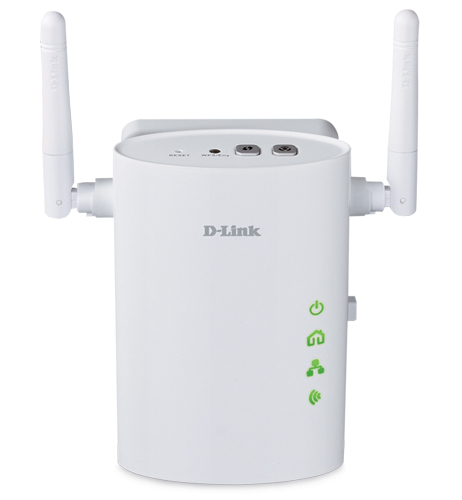 Back when I reviewed D-Link's DHP-1320 PowerLine Router, I promised to do its companion network extender AP. It took me longer than I planned to get back to it, but today it's all about the DHP-W306AV PowerLine AV Wireless N Extender. The W306AV's might lead you to believe that it is only good as an auxiliary AP to extend WLAN coverage. But, it actually is a pretty full-featured AP in a compact wall-pluggable package that can also stand on its own. The AP isn't much larger than its powerline-only DHP-306AV sibling. But housing both powerline and 802.11b/g/n AP circuitry makes it a bit deeper. Still, if you plug it into the bottom socket of a duplex wall outlet, you'll still be able to use the top socket just fine. The front panel callout diagram (Figure 1) shows the wireless and powerline network indicators that reveal its ability to connect to your network via 200 Mbps HomePlug AV powerline or 10/100 Ethernet. I put top and side views in the gallery, which show the buttons for starting a Wi-Fi Protected Setup (WPS) pushbutton session or powerline encryption cycle, 10/100 Ethernet port and other controls. There's even a power switch. I know better than to open up tightly-packed products like this one, so relied on the FCC filing pictures, which were actually pretty good. Figure 2 shows the view you get when first opening the product, which reveals the radio board at the top level (furthest away from the wall socket. I have other shots of the various stages of disassembly in the gallery. Figure 3 shows the lowest level that contains a lot of the larger powerline interface circuitry and power supply for everything. Figure 4 is a closeup of the radio / RF board, which reveals a Ralink RT3052F 2x2 802.11b/g/n AP / Router SoC handling the access point functions. I was able to make out 32 MB of RAM, but couldn't find out how much flash is used. The gallery photo of the powerline board reveals the same Qualcomm/Atheros INT6400 / INT1400 third generation HomePlug AV chipset as used in the DHP-1320. (The chipset shown is actually marked Intellon, which was purchased by Atheros before being in turn swallowed by Qualcomm.) This board also has 16 MB of RAM on its backside. I should note that this is the first 11n powerline-connectable AP that has a two-stream N radio that will support link rates up to 300 Mbps (in Auto 20/40 mode). Other products like the Innoband kit I tested last year and the Zyxel router I tested a few years ago use single-stream N and b/g radios, respectively. I thought that NETGEAR's XAVN2001 Powerline AV 200 Wireless-N Extender was only single stream because there was no mention of link rate in any of NETGEAR's promotional material or product descriptions. But a check of its Wi-Fi Certification certificate revealed that it too is dual-stream. The DHP-W306AV doesn't have an online emulator You can explore the DHP-W306AV's online emulator and can also download the manual to check out its features more closely. Here is a summary of its feature set. There are screenshots of most of the admin pages in the gallery. I'll also note that there is an annoying 15 second save required for each page when you make admin setting changes.